The list of the best ski resorts for December skiing in Austria is not quite the same as the resorts that open the earliest for the ski season (although there is some cross-over). For a start, an early-season ski holiday relies on a good amount of the ski area being open, rather than the smaller amounts of skiable terrain that may be open before December. Some resorts also prefer to open up larger areas during the weekend and restrict the runs during the week. For that reason, we’ve concentrated on resorts which are generally high and which usually have a decent part of the skiing open seven days a week in the period from the start of December through to the weekend before Christmas. If you want to find out which resorts open early and what the actual dates are, then take a look at our article covering opening dates for Austrian ski resorts. Has to be #1 on the list. 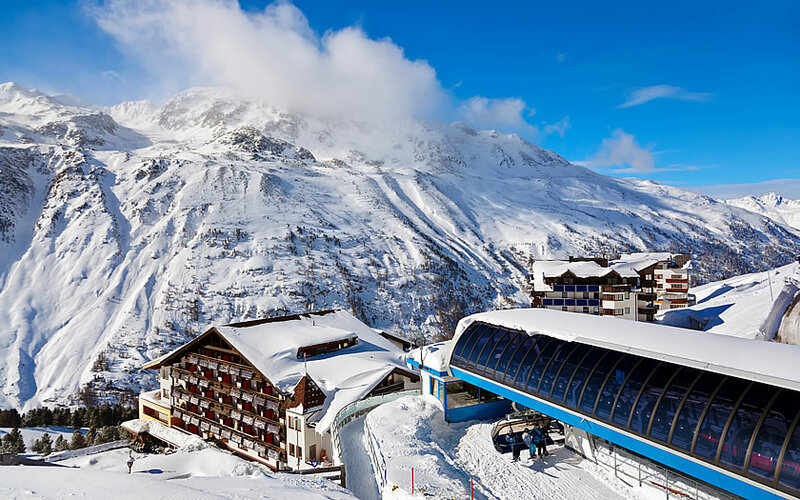 Obergurgl has a long history of getting its skiing open early and really, who should be surprised, with the main village at an altitude just under 2000 meters? Some British travel companies operate ‘white weeks’ to the resort before Xmas, so there may be deals available both for package holidays and flight seats into Innsbruck. Obertauern is Salzburg’s answer to Obergurgl. Rather than being up at the end of the valley, it is a settlement on a mountain pass, but it shares a lot of the advantages and disadvantages of the resort above. The ski runs start outside the accommodation and it shares with Obergurgl the advantage of a very high altitude for the village, meaning that the runs back down from the slopes are generally available. The location on a main traffic artery is also advantageous as the drive down from Salzburg airport is mostly on the motorway. The first of the Tyrol’s big glacier ski areas. Sölden starts the winter ski racing season off and uses that as successful advertising for its autumn skiing. In December, the skiing up on the glaciers is still in full swing but there is also the possibility that some, if not most, of the ski area above the town could be open, meaning that the long haul up the glacier road is avoided. Another village with access to a glacier ski area. Neustift offers the advantage of being close to Innsbruck airport and yet having very good connections to the Stubai glacier. Those who have skied in France may dismiss glacier skiing, but some of the Austrian glaciers offer extensive areas and are attractive possibilities for pre-Xmas skiing. Ischgl is a great high altitude resort during the season and just creeps onto this list ahead of places such as St Anton or Kaprun because of the effort it puts into the early season send-off. The Top of the Mountain concerts at the beginning and end of the season generally have a world-famous star as the centrepiece of the opening and closing of the ski area.